On land, when you are in an emergency situation, your survival instinct is usually to stay on your feet so you’re prepared to maneuver out of the danger. When you’re in the water in an emergency, that same instinctive reaction can lead to one of the most deadly accidents: foot entrapment. NRS crew practicing swiftwater rescue techniques under instruction from Charlie Walbridge. Matthew and Emily are assisting each other in wading through current and Terry is using a paddle to maintain stability. You can’t clearly see what’s under the water. Rocks, logs and other obstacles can be waiting there to trap a dangling foot. When this happens in moving water, there usually isn’t time to remove the foot. The current pushes the swimmer down, often holding their head underwater and usually resulting in a drowning. Having on a PFD usually doesn’t save you; the force of the water can overwhelm that flotation. Saving someone in this situation is very difficult and rarely successful. You have only a very few minutes to reach a person whose head is under water. Sometimes a line stretched across the stream can help support the victim’s head above water until a rescue to remove the foot can be made. This technique, along with wading out to the victim assisted by a paddle or with the help of other boaters, is illustrated and explained in River Rescue by Les Bechdel and in Swiftwater Rescue by Slim Ray. 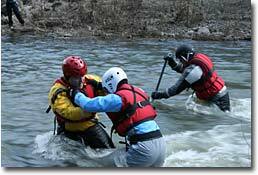 These are advanced techniques that are best learned and practiced while taking a swiftwater rescue class. 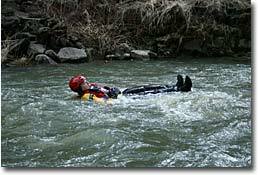 See our Safety and Rescue Discussion Group article for tips on finding swiftwater rescue instruction. As with most accidents, prevention is the best solution. When you find yourself in the water, it’s usually best to assume the “swimming safety position”: on your back, with feet up and facing downstream. This allows you to look downstream and push off any rocks or other obstacles with your feet. You can backstroke at an angle to the current and work your way to shore or into an eddy. If the water is deep enough and you need to move more quickly, you can roll over on your stomach and swim aggressively to avoid danger or get to shore. Again, always keep your feet up to avoid entrapment. The basic rule is: never stand up or put your feet down in the water, unless the water depth is below your knees or the water is calm. Sometimes swimming is unavoidable. However, staying calm, working to self-rescue and remembering this basic rule can usually keep you out of trouble. Boat Often & Boat Safe!